Sometimes our clients aren't quite sure what to pick out and need a little extra guidance. This may be particularly true for men trying to purchase gifts for a special someone in their lives. We understand that it can be difficult to visualize our jewelry based only on an enlarged picture on the monitor. 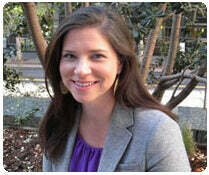 Therefore, we offer this special section of Maggie's recommendations and her reasons behind each pick. Enjoy! "Well, considering this is my wedding band, I had to choose it! Ha! 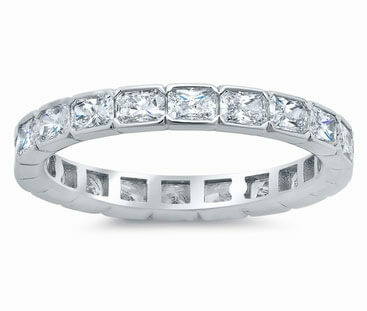 I love radiant cut diamonds and I just love the idea of an east west style wedding band design. This is a great band to wear alongside your engagement ring or to stack with other bands. Love this ring!" "Round diamond studs are a perfect staple for any woman! They are great to wear on a daily basis or to add some sparkle for a night out. Also, diamond studs will never go out of style." "This is a perfect necklace for women of any age. 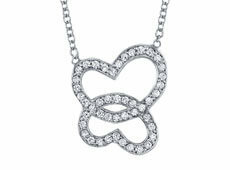 The interlocking hearts feature beautifully set micropave round diamonds. The picture does not do this piece justice." "Love this bracelet. 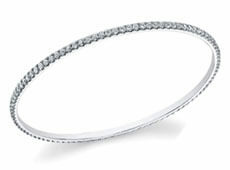 The best part is that you can wear it alone or stack it with any of your other bangles. The diamonds are hand set by our expert pave setter. Another staple piece!" "Three stone rings are fabulous and I chose this one because guess what?!? This is the same style as my engagement ring! Be sure to click on the video and you will be in love with this engagement ring style, too!" "What woman doesn't want an eternity ring? You see round brilliant cut diamond eternity rings everywhere. I chose a cushion diamond eternity ring as one of my favorites because it's a little more unique than your typical round brilliant eternity. Square cushion cut diamonds give you a similar look to round brilliants but, in my opinion, give you something a little more unique. I chose the 4.00cttw option because who doesn't want a little more bling on their hand? 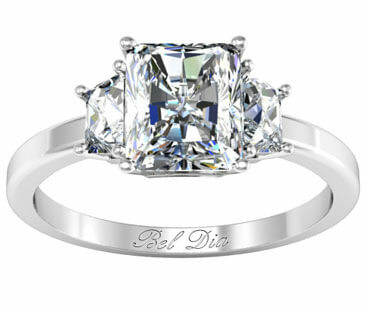 :)"
"This is one of my favorite engagement rings that we manufacture here at deBebians. I love the simplicity of the u pave set diamonds on the shank and the clean lines of the basket that will hold your center diamond. It's 2mm wide which gives you enough width while still being a delicate design. This is a classic and timeless engagement ring that you will love for years to come." "Well of course I would choose this... just kidding... it's not my ring, but it's over the top gorgeous and I love radiant cut diamonds! 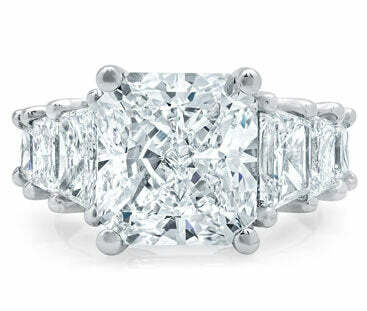 This is shown with a 4.21 ct. center radiant diamond... drool! This setting is intended for a larger shape center diamond but we can always modify the side diamonds to accommodate a center diamond of any size." "A floating diamond solitaire necklace is a classic piece that can be worn at any age for years and years. 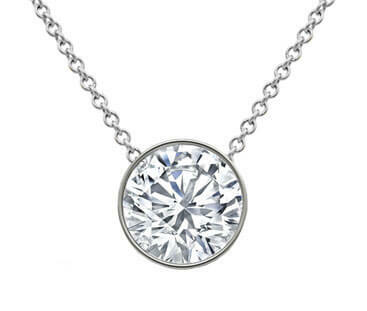 Personally, my pick would be a 0.75 ct. round diamond in a bezel style setting in white gold. This is truly a piece that will always be in style and can be passed down to your daughter. Love that!" 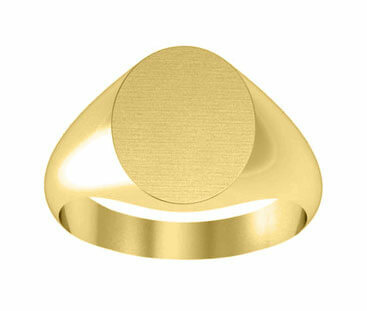 "To me, a yellow gold signet ring is another classic piece. I chose an oval style with a solid back. For the engraving, I would choose the interlocking script monogram with the hand engraving. Maybe it is the 'east coaster' in me, but I love signet rings and anything that has my monogram!"